Here is a little bit of what I did... Mister M had these 2 same turtlenecks with different colors, I've had them in fix-it pile for while, just waiting for the right project to come along. Miss E isn't a fan of turtlenecks and I was thinking of making her some boats neck long sleeve t-shirts, but never got to it. And now summer is around the corner and what better than a comfy dress! I used the original body of one of the tees, then made the sleeves shorter added a wide cuff at the hem and sleeves with the second turtleneck and put in a new neckline. It took about 30 min to cut and sew. What a great way to extend the life of a loved t-shirt, don't you find? And with the color block trend this is the perfect opportunity to give this a try! Are you inspired to stitch up your own two-tee dress?? 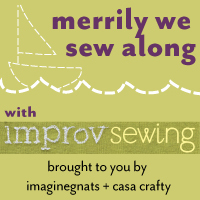 we would love for you to sew along with us (merrily, even) and share pictures in the merrily we sew along flickr group. ... and don't miss the posts from our lovely sew along co-hosts: casa crafty and imagine gnats. episode four: two-tee dress is sponsored by Creativebug. we're excited to tell you that the winner of this project will receive a one month subscription to the fabulous classes on the Creativebug site! perhaps you fancy learning how to crochet at midnight or have a hankering to paint in your pajamas? as a Creativebug member, you’ll have unlimited access to all of their workshops, anytime. featuring workshops from some of my favorite artists like Liesl Gibson, Kaffe Fassett, Anna Maria Horner... and even improv sewing's Debra Immergut and Nicole Blum, you're sure to find plenty of inspiration. so, stitch up yourself a two-tee dress and share a picture in the merrily we sew along flickr group by april 30 to be entered to win!! we can't wait to see what you stitch up.